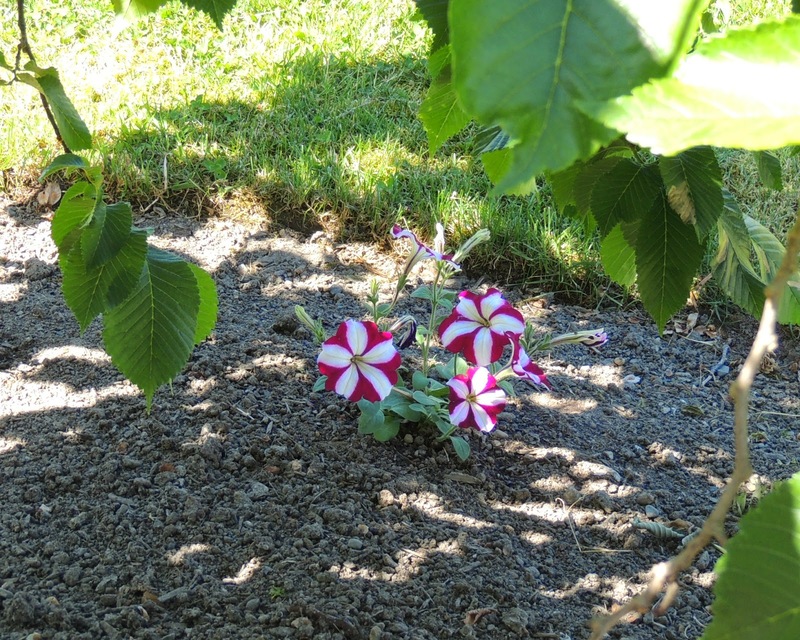 Every year I plant Wave Petunias in the garden beds around the trees and up our front walkway. Some years they "wave" and some years they don't. I haven't figured out what I'm doing wrong in the non-waving years. Maybe it's the weather and not me? 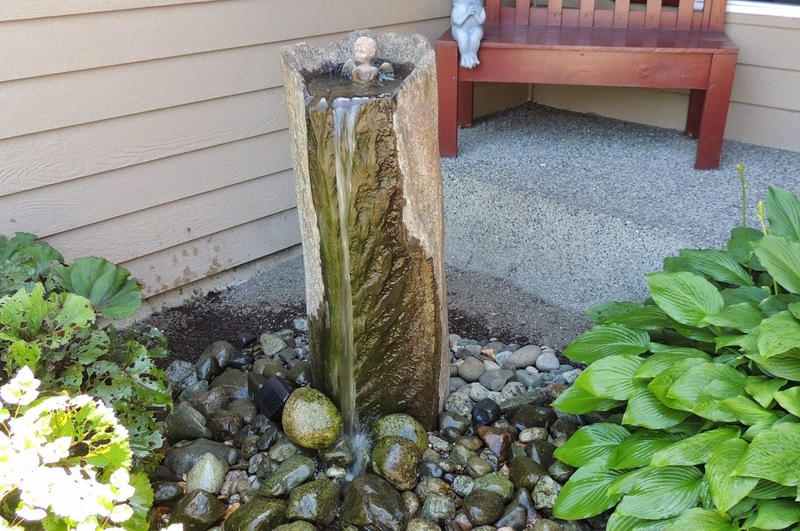 My family gave me this fountain a few years ago for my birthday. It's my favorite thing in our yard! Love this little frog that lives in the rocks around the fountain. The peonies are in full bloom. We staked them up - they are so top heavy, they were falling into the neighbor's driveway. Our local nursery was selling blueberries in pots for buy one, get one free. Too good to pass up! The deer will probably eat them before we can. The "thinker" frog. Obviously, there's a bit of a frog theme around here. Now that I think about it, time is running out on my rich and famous plan. Better start working on the boys...or get better gardening gloves. Thank you! We get different results every year too. It must be the weather, which is so unpredictable around here. It's so neat that you live in your parent's old house! I love the peonies - but sadly they don't last very long. Your landscaping is beautiful, and the fountain and peonies are gorgeous. I have one peony plant and it is just starting to bud - I can't wait for it to flower. Good luck with the blueberries! LOL Susan, you're right! We'll see who gets the blueberries first - us or the deer! Thank you! Notice I only showed select pictures, not the whole yard :). 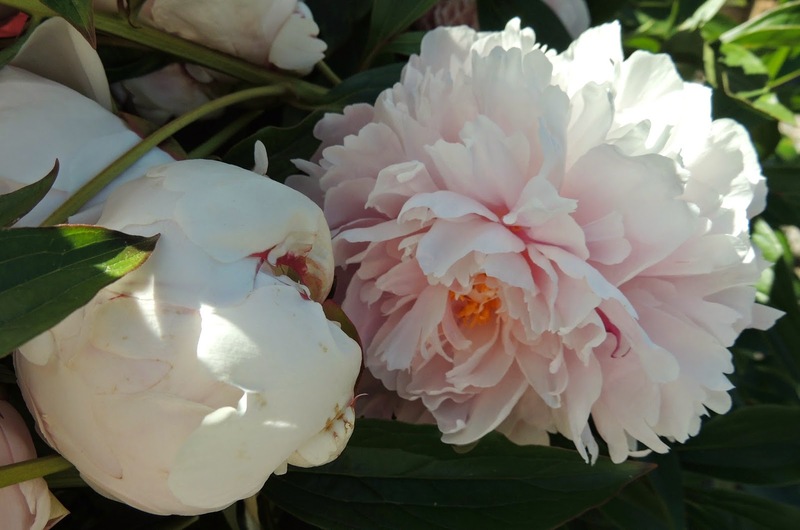 You have beautiful landscaping and those peonies are so pretty! We have been whipping our yard into shape too. Some years it looks great and some years not so much. Thanks Jill. We'll see what kind of summer we have, and maybe my petunias will wave! Thank you so much for stopping by and reading! Oh trust me, my thumb is not so green. We just get lucky sometimes! Hi Lana, what a pretty garden you have and I love the fountain and frogs. Have a wonderful week. Thanks Julie, The fountain and frogs are my favorite part too. More power on your gardening endeavors Lana.....summer is a perfect time to make it real pretty! Thanks Rebecca. Summer was here, but now it looks like it's leaving again. Ah, the joys of living in Seattle! I love your thinker frog! We've got a lot to do to get our yard ready for summer. We've been working on the pool area first, but the weeds are really bad in certain spots in the yard! If I had a pool, I would work on that area first too :) I love my thinker frog too!